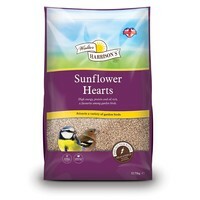 Walter Harrisons Sunflower Hearts are packed with high levels of energy, protein and essential oils. The Hearts are a favourite among a wide variety of garden birds, and are 100% husk free, meaning no waste and no mess. The best value sunflower hearts I've found. I buy a lot as I have lots of goldfinches visiting my garden. Unfortunately, the squirrels love sunflower hearts and get through a lot of them too! So I'm always looking for the best price and this is the winner so far.